Most of us are familiar with the Minions even if we haven’t seen the film they appear in – Despicable Me. These little yellow creatures are now the inspiration for a colourful online slot from Quickspin; it’s called Spinions Beach Party and we join these little creatures as they cavort on the sand handing out free spins and sticky wilds. 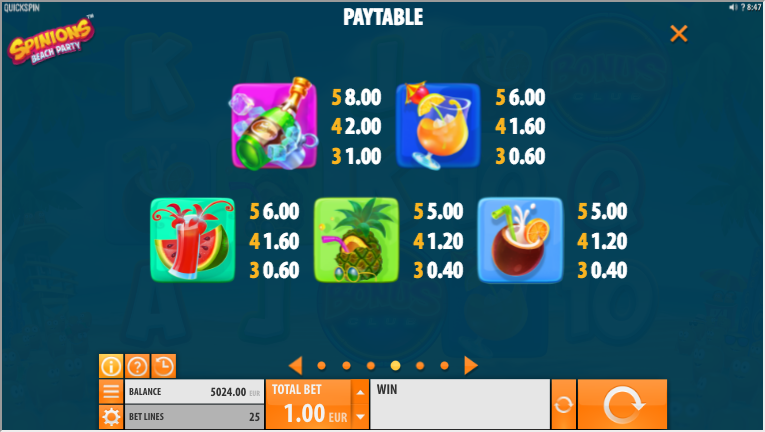 Spinions Beach Party is a five reel slot with three rows and twenty five fixed paylines; the game has a very sunny disposition and behind the symbols there’s a beach view with calm blue seas, palm trees and plenty of cute orange creatures. There are five high value, theme-related symbols including a bottle of champagne and four fruity cocktails – orange, watermelon, pineapple and coconut; lower values are the standard 10, J, Q, and A. The Spinion represents the wild and he will replace all others except the ‘Bonus’ scatter symbols which is the key to one of the features. This is triggered whenever two or more wild Spinions appear anywhere on the reels – any wins are paid out and you will receive a free spin with those wilds stuck in place; if any more wilds land you will receive one more spin and this process continues until no more wilds are collected. Trigger this by landing three of the Bonus scatter symbols anywhere in view; you will now receive ten free spins and any during this round any wild Spinions which land will stay in place for any remaining spins. Once the spins are over you will be returned to the base game – there’s no way to trigger any additional ones. 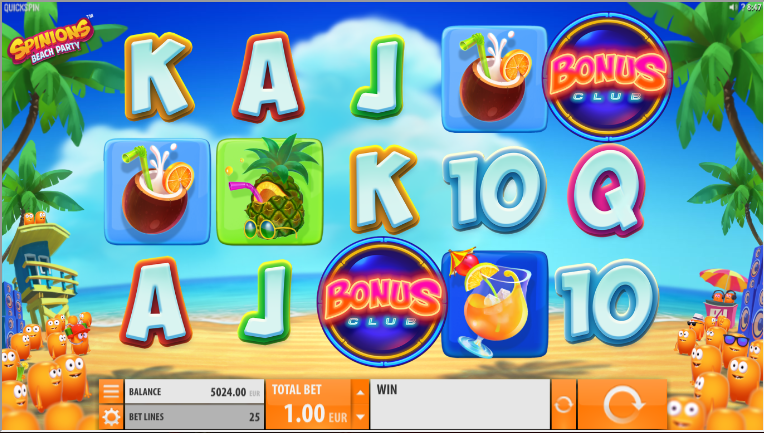 Spinions Beach Party is a well-designed and good-looking game which lives up to the usual high standards from Quickspin. The bonus features add some variety and it comes with an RTP of 96.05%.